Home / TRUTH OR LIES (Revelations) / THE PROTECTION OF CHEMTRAILS / YOU BELIEVE IN CHEMTRAILS? If you do not believe in chemtrails, read this info once! Still there are those who stubbornly hold full of the large chemical clouds over our heads "airplane stripes". For those, there is now a clear and concise video that puts an end to all doubt. If only because of the caliber, expertise and the amount of people now make video statements about the existence o f this crime against humanity. Often we see people who have never believed in the existence of chemtrails anyway once really open their eyes and scared on a good day. That's a bit the story of Jeff Nelson. Lifelong this man was commercial pilot with a major airline US citizen whose last years as head instructor. He had never really thought about the phenomenon of chemtrails, but now is the extent awake he dares to testify with his hand on his heart that what we spend hours in the air show hang absolutely no contrails (condensation trails) are like the authorities we want make believe. 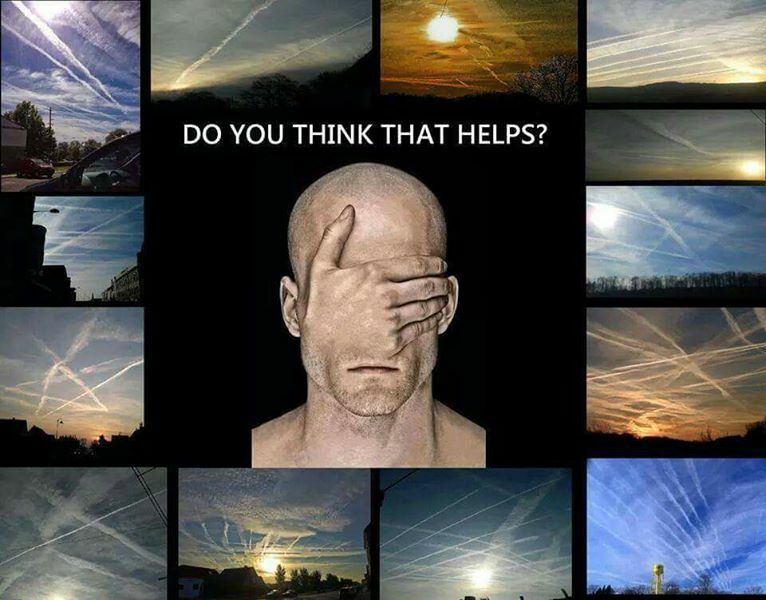 For example, in the video below, a number of experts in their own fields which testify that chemtrails, or perhaps more accurately geo-engineering, is indeed the order of the day. So if you fear you Dr. Steven Davis approximately 40 years of research to his name, says the chemtrails the DNA of some people irreparably damaged. When Mark McCandlish, a former employee of US defense, should explain how the warming of the millions of nanoparticles released into the air you can change the weather and can regulate air flow, you understand somewhat that geo-engineering is nothing more than a weapon that can be used and against other countries, but also against their own people as in the case of California. Apart from the strategic interests involved in geoengineering there are the implications for human health. Because the particles are nano, tiny, they are easily absorbed by the human body, even through the skin. It is not for nothing that it is the common aluminum nanoparticles have a very harmful effect on the human immune system. The video explains that aluminum sits on the receptors where Magnesium is supposed to be and thus disrupts everything. It explains that you can do something about the use of chlorella which binds to harmful metals and to help detoxify your body. Combined with supplementation of Magnesium so that it returns to the correct location in the body can position itself on the receptors. Moreover, almost everyone in the western world shortage of magnesium and thus you will become more vulnerable to metal particles in your body that disrupt things. A well-absorbed form is magnesium L-threonate. An interesting book about what a lack of magnesium in your body and is caused by abnormal behavior: Magnesium, the solution of Dr. Marianne Mousin-Bosc. Slowly but surely, the physical resilience of affected humans and gradually more and more strange diseases stabbing its head. Not only physically, but also mentally humans is influenced by all those poisoned nano (metal) particles in the atmosphere. Take half an hour and check out the following video. You've likely that after seeing it you adjust your opinion about chemtrails. There is a flyer made about this phenomenon from a genuine concern for public health and from the pursuit of a better world. You can order flyers so you can warn others of the dangers of chemtrails. The flyer is clearly described where chemtrails (geo-engineering) are responsible, for example, think of the many health problems. For those who want to contribute can order some flyers at me to stop this criminal phenomenon of chemtrails. Lusado Holkenborg a PB is sufficient.